Are there manual garage doors that you can open and close by hand? Sure, but these days most people prefer electronic garage door openers. 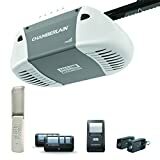 With a powerful, robust garage door opener, your garage door can be operated smoothly and quietly from inside your garage or outside your house. Indeed, smart technology now makes it possible to control your garage door from anywhere using a smartphone or tablet. This provides you with augmented security and control. Many garage door openers nowadays include other advanced features as well to enhance functionality and convenience. If you want to purchase a garage door opener but are not sure where to begin, check out the table below. Still not sure what type of garage door opener you should buy? Read on to find out what kinds of questions you should ask while you are shopping, and then scroll down to learn about features. 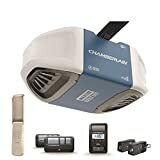 Below the buying guide are reviews for the best garage door openers. A garage door opener is system which is used to open and close a garage door. The device is motorized. A set of switches located on the wall can be used to control the opener, pulling the door up or pushing it back down. The opener can also be controlled via a remote. Models which have smart technology enabled can be controlled using a tablet or smartphone. What are the dimensions of your garage door? Not all garage door openers are compatible with all garage doors. Check the dimensions of your door as well as other technical specifications, and then make sure that the garage door opener you are considering is compatible with it. What kind of installation work are you ready to handle? Some garage doors require significantly more intensive work to install than others. Take an inventory of your tools and skills and think about what you will be able to handle. Then read up on the installation procedures required for the garage door opener you are considering to see if you will be up to the task. What type of device do you want to use to operate the garage door? Do you want to be able to operate the garage door using a proprietary remote control? A third-party remote? Your smartphone or tablet? What OS are you running on your mobile device? 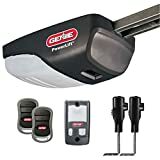 Make sure that the model of garage door opener you are considering is going to be compatible with the method you want to use to open and close the garage door. Some garage door openers are notoriously loud and irritating when they open and close. Others glide more smoothly and quietly along their tracks. Look for belt drive systems that have special features designed to curb noise and vibrations. What happens if your power goes out? With systems which rely on the grid and include no energy backup, you are stuck trying to manually crank the garage door open or closed. This can be a real pain—and in some cases, may be flat-out impossible. With a battery, your garage door opener has a secondary power supply. That way even if the power does go out, your garage door will function as usual. Some garage door openers are now equipped with smart control technology. That means that no matter where you are on the planet, so long as you have a compatible smartphone or tablet, you can open or close your garage door. Some smart garage door openers can even be linked up to the lights in your home. That way when you open your garage door, the lights inside your house come on as well. Maybe you don’t have a lot of space in your garage—or perhaps you simply want to keep the appearance of clutter at a minimum. Either way, a compact design can go a long way toward streamlining the look and feel of your garage. Garage doors can be quite dangerous if there are not vital safety features installed in the opener. Shop for a garage door opener which includes a protection system in case a person or object ends up underneath the door while it is closing. With such a system in place, the opener will sense the presence of the object and will automatically reverse the door’s movement. This ensures that nothing becomes crushed beneath the door. Nothing is more annoying than driving away from your house only to realize several blocks away that you are not sure whether you closed the garage door. So you reverse and drive back to check. Whether you did or didn’t forget it, you have wasted time, and might even end up late for an appointment or a flight. A timer is a great feature which prevents hassles like these. Every time you forget to close the garage door, the timer will do it for you automatically. You may even be able to customize how many minutes you want it to wait before it closes the door. Garage door openers have a lot of components—which means a lot of parts which can break. Getting a garage door opener repaired on your own can be costly. For that reason, you should shop for a product which includes a solid warranty. Look for a few years on the parts and accessories, and lifetime on the belt and motor. That way you can be assured that your purchase is protected. Now you know what features to shop for when you are looking into garage door openers. 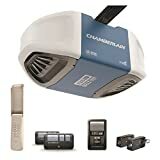 Take a quick look back at the chart at the top of this page for a fast guide to top garage door openers you can buy online. Otherwise, read on for detailed reviews of some of our favorite models. 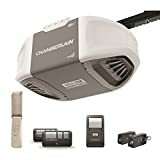 If you are in the market for a mobile-enabled garage door opener which includes some other smart features as well, consider the ½ HP Chamberlain WD832KEV. This garage door opener includes a number of sophisticated functions and benefits. Quiet, steady operation. The belt drive is steel-reinforced. Together with the Chamberlain Motor Vibration Isolation System, this keeps vibration to a minimum. This in turn ensures that operation is smooth, steady and quiet. MyQ-enabled technology. The MyQ compatibility of the system allows you to operate the garage door opener using your mobile device. You also can control your house lights. You do need to purchase a separate gateway for this. Timer system. You can set the timer to close the door automatically for you in 1, 5 or 10 minutes. Protector system. This safety feature automatically reverses the movement of the door if an object or person is sensed on the way down. Quick install rail system. You can get the WD832KEV set up quickly and easily. It shouldn’t take you more than a couple of hours. Program remotes from the wall button. If you have a new remote, you can program it without having to climb up to the main unit. Not compatible with all wireless control systems. For example, if you have the popular HomeLink system, it may or may not work with this garage door opener. 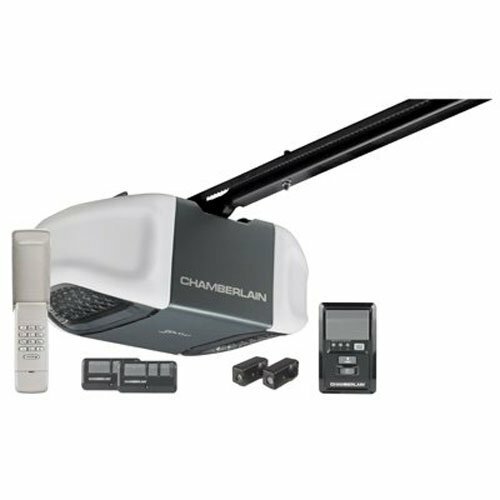 Another Chamberlain model worth considering is the WD962KEV Garage Door Opener, ¾ HPS. As you might guess, it includes many of the same features as the model just reviewed. Quiet performance. 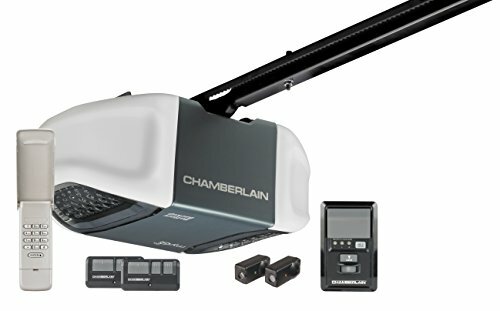 This garage door opener includes a ¾ HPS DC belt system. This system is designed specifically to offer quiet, smooth operation. This point deserves some extra emphasis. It is very, very quiet. MyQ-enabled. This is the smart technology which allows you to control the garage door opener using your mobile device. You can even set it up to notify you anytime someone else opens or closes your garage door. You do need to purchase a separate gateway for this. Operate your garage door even when the power goes out. You can do this thanks to the battery included with the system. Timer included. You can set the garage door to close automatically after a period of 1, 5, or 10 minutes. Quick-install rail system. You should be able to install the garage door opener within a couple of hours. Turn lights on automatically. The system senses motion, and can turn on lights automatically for you. Homelink issues exist. Once again, this system is meant to be compatible with Homelink, but does not seem to deliver on that promise. This may be a matter of needing external adapters. To be fair, the manufacturer does mention this, but most people are looking for immediate compatibility without the need to hunt down third party adapters. If you dislike the bulky design of your typical garage door opener, you may want to check out the LiftMaster 8500 Elite Series 8500 Jackshaft Operator. This garage door opener has a lower profile, perfect for saving space in a small garage. Sleek, compact design. You can mount this garage door opener on the wall next to the door. Its low profile makes for a clean look while freeing up space on your ceiling. MyQ-compatible. This mobile technology lets you control and monitor the garage door no matter where you are located. The app is free, but you do need to purchase the gateway separately. Quiet operation. The design of the system completely eliminates vibrations in the ceiling. This makes the garage door opener much quieter. Extra security. The system is equipped with Security+ 2.0™. This feature sends a new code to the garage door opener with every click so that only you are able to open it. Open the door even during a power outage. 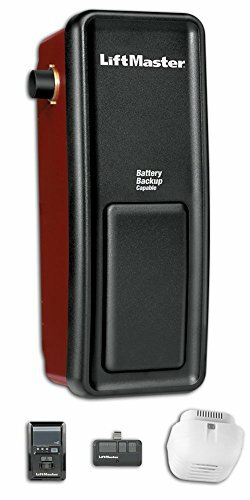 This garage door opener can work with a battery, offering a backup power source during grid outages. Advanced safety features. With the LiftMaster 8500, audio and visual warnings let you know when the door is going to start closing. Protector System senses if there is an obstacle underneath the door and automatically stops the motion and reverses it if there is. The lights also come on automatically when you enter your garage. PowerLock Deadbolt secures the door against forced entry from outside. There may be some replacement part issues. While the company offers a warranty, sometimes replacement parts arrive in a non-working condition (particularly circuit boards).